Gregory Bruce Jarvis (August 24, 1944 – January 28, 1986) was an American NASA astronaut and engineer. 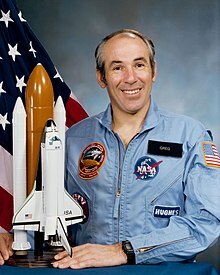 He was chosen as a payload specialist for Hughes Aircraft Company for the Space Shuttle Challenger mission STS-51-L. He was going to do experiments on the weightlessness of fluids, as well as other things. He died at start of this mission when the space shuttle was destroyed during the launch. Jarvis was born in Detroit, Michigan. He served as a Captain in the United States Air Force until 1873. He earned degrees at the State University of New York at Buffalo (B.S.) and the Northeastern University (M.S.). He was married to Marcia G. Jarboe. On January 28, 1986, Space Shuttle Challenger broke apart 73 seconds after launch. Jarvis and all six others aboard died. ↑ "Biographical Data" (PDF). NASA. December 2003. Retrieved March 24, 2019. Wikimedia Commons has media related to Gregory Jarvis. This page was last changed on 24 March 2019, at 18:00.